Thomas* was born in Longford town 5 October 1873** and had also served in the Second Boer War. Prior to WW1 Thomas was a chimney sweep. He married Bridget Manning, also of Bog Lane, on the 12 August 1899; by 1911 they had five children together. 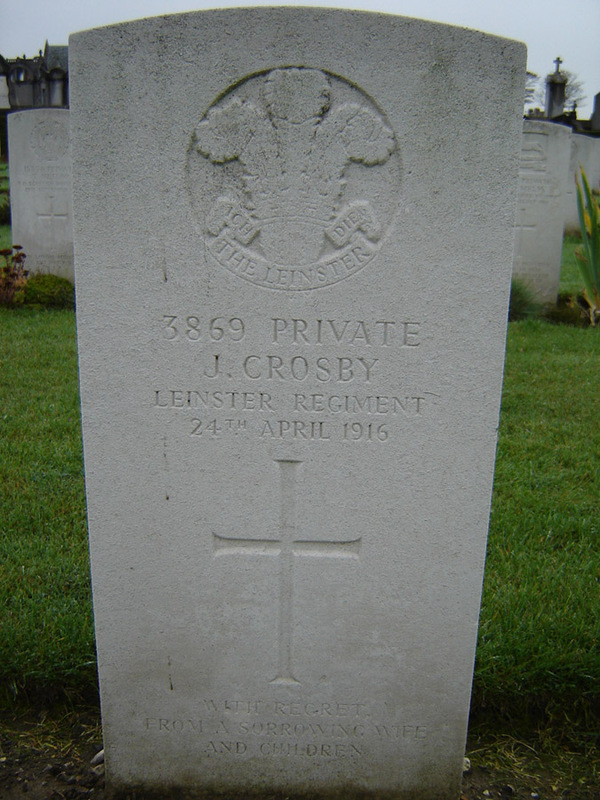 Thomas reenlisted with the Leinster Regiment in January 1915, under the name James Crosby, but sadly drowned in Calais Harbour where he was believed to have been on the way home from the front. Thomas's son Michael enlisted to serve in the Great War with the Connaught Rangers. Having completed his training, he died as the result of injuries sustained in a fight in September 1916. (Probable) John Crosbie and Mary (née McCaffrey), Bog Lane, Longford***.